As we’ve seen in recent years, extreme changes in the weather affect different groups in Australia differently. Wealth and privilege, as they do, will protect some people for a while. Discretionary wealth, if you have it, allows you access to items like air conditioning, shade, medicine to guard against emerging infectious diseases, and also money to buy food and shelter. But, as we see globally, vulnerable people invariably suffer the most during disasters and extreme weather events. It’s not always due to a lack of personal resilience, or spark, but simply because the realities of poverty, exposure to the elements and a lack of equitable access to resources, mean that they will feel the effects disproportionately more. Some groups – the old, infirm and frail, disabled people, homeless people, people experiencing mental illness, young people, children and babies – are most at risk. At Marist180, we are deeply concerned about homeless young people who, during extreme weather events, lack the ability to mitigate against the effects of the disaster, they lack resources to overcome the impact and they have restricted ability to live alternatively. This is a complex and layered topic, with many intersecting and overlapping issues. So this will be the first of three blog posts exploring the relationship between climate change and homelessness, climate change as a gendered and feminist issue and climate changes’ impact on global justice and security. This post will focus briefly on some of the health issues climate change will have on the homeless population in Sydney. The impacts of climate change are already being felt in Australia, with some of the strangest weather on record happening across the country, let alone across the planet. We can protect ourselves with early warning systems that our governments set up to notify us about potential dangerous situations. These will include warnings for storms, intense flooding, drought, air pollution and heatwaves, and we will be able to stay inside, or spend money to buy air conditioners, migrate or reinforce our homes. But what if you have mental health issues and are sleeping rough on the street? What if you don’t know that a heatwave is coming, or an extreme storm? What if you don’t have any money? 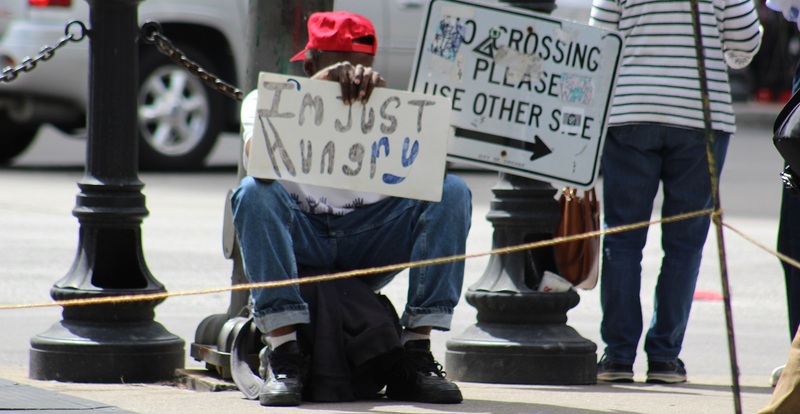 Homeless people and those who lack support networks, access to technology and basic resources are already extremely vulnerable to dangerous weather conditions, and when those stressors are made worse or more unpredictable by human-caused climate change, people will die, and organisations are likely to struggle to keep up with demand for their help. It is not a coincidence that there is a spike in mortality during heat waves. It reflects a failure to understand and support vulnerable people, many of them homeless, even in a rich country like Australia. We need to factor the impacts of climate change into what is already a tough and bleak situation for the over 105 000 young people who are sleeping rough on the streets here. Will people be able to eat properly? Does anyone remember the great banana shortage of 2006? These dark days happened (I’m a Queenslander, it rocked my world) when Cyclone Larry devastated Australia’s banana industry, destroyed fruit worth $300 million and left up to 4,000 people out of work. North QLD produces 95% of Australia’s bananas and these were completely wiped out. Bananas at $3.00 a pop. If you were lucky. Now imagine applying this shortage to every fruit and vegetable we produce in Australia and globally. Every year, in every season, in every state, in every country, forever. This is a scenario we’re increasingly going to have to confront with increased destruction of crops through either drought or other extreme weather patterns. The impact of this on food production and food distribution systems in Australia, means crops will become scarcer and prices will go through the roof. It’s probable that the nature of what we eat will change, and much of the food we take for granted will become unavailable. Fresh produce only for the very wealthy? You better believe it. Homeless young people already struggle to have their basic nutritional needs met due to the inadequacy of social security payments, and the resulting poverty, if they are even receiving payments. The already high costs of healthy food has been identified as one of the main barriers to food security in this group, and the gross inequity in housing and food security we are seeing in Sydney, is going to skyrocket, if we don’t make urgent and substantiative moves to stop the increases in temperature we’re already seeing. Access to fresh and nutritional food, and a safe place to live, are part of the social determinants of health, or the things that protect us from early disease and death, and cause health inequity in countries. Homeless young people are already struggling in Sydney and with climate change, their ability to access food, good food, is going to get worse. What about other health impacts? As climate change warms Australia up, we are seeing infectious diseases that are spread by mosquitos, starting to spread south. Because so much of their time is spent outside, homeless populations are more vulnerable to mosquito bites, so they are more likely to catch a disease like Dengue fever, Ross River virus, Barmah Forest and Murray Valley encephalitis. The public health interventions and improved surveillance that will be put in place to warn people of the risks, may not reach the vulnerable in our communities in time. Another factor that affects health, is air pollution. This exists outside from vehicle exhaust and particulate matter, making those who can’t go inside more likely to suffer from lung and heart disease. And because most homeless people live in cities, the urban heat island effect (concrete jungles) can magnify the impacts heat waves have on those who cannot easily seek relief inside, or have access to shade and air conditioners and enough hydration. Extreme weather events like storms, floods, and heat waves, can threaten entire cities, but people experiencing homelessness suffer excessively compared to the general population. As an organisation we are taking hard action against climate change in NSW, VIC and QLD. Through creating green spaces and local sources of food, we combat the urban heat island effect and also food insecurity. Through the Seedwell program in Melbourne, the Daramu healing garden in NSW and the new organic farm acquisition in QLD, Marist180 is making hugely positive steps in educating and protecting the public, our clients and ourselves on these urgent issues, and honouring our first peoples’ wisdom when it comes to being ancient custodians of the land. Catch public transport when you can, buy local, grow plants, read and learn, take a cup with you to fill up when you buy a coffee, donate money to organisations that are fighting for a worthy cause (like Marist180’s Turn Her Life Around For Good campaign ). March and rise. Make sure you fight for gender equality (more on that in the next blog). Also, take heart that it is not too late to stop the impacts of climate change, but that it is all our responsibility, particularly, as rich countries like Australia have been the ones to create the problem that will hit the poorest of us first. Written by: Rachel Burns, Marist180 Skills Development Centre Coordinator in Brunswick, Victoria.